We hope you had a wonderful time on The Oxford Club’s European Opportunity Expedition. 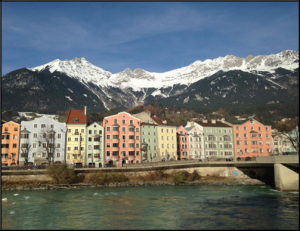 Our stays in Zurich, Innsbruck and Vienna provided many interesting investing opportunities as well as culinary delights and trips to fascinating historical sights. Perhaps the greatest investment opportunity was the glühwein stands. Glühwein is hot mulled wine that is absolutely perfect on a cold winter day. Our group spent many Swiss francs and euros warming up with a tasty mug. I discussed Pharmerging markets, which are markets that are starting to spend more on medicine. These are countries like China, Venezuela, Mexico, Brazil and Turkey. Pharmerging markets will be responsible for two-thirds of global growth in biopharma over the next three years. I also showed why European pharmaceutical companies were inexpensive compared to their American counterparts and mentioned Novartis (NYSE: NVS) and GlaxoSmithKline (NYSE: GSK) as my two favorite European pharmaceutical companies. I was followed by Marc-Andre Sola of NMG International Financial Services. He is a Zurich-based money manager with an emphasis on asset protection, estate planning and tax privileged growth. To contact Marc, please e-mail him at Marc.Sola@nmg-ifs.com. Our last presentation of the day was by Knut Andersen, General Manager of Swiss Metal who discussed investing in some unusual metals including Gallium, Bismuth and Tellurium – not your typical metal investments. To contact Knut, please e-mail him at knut@swissmetalassets.com. These metals are rare, but are used in many household products and military systems, making demand for them huge. Through my contacts, I was able to arrange a private meeting in Basel, Switzerland with pharmaceutical giant Roche (OTC: RHHBY). 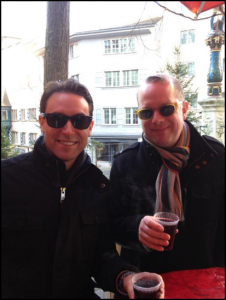 Oxford Club Event Director Steven King and I warming up with some glühwein in Zurich The meeting started out with a presentation by Head of Global Product Strategy and Chief Marketing Officer Bill Anderson. He discussed the company’s philosophy, which is to conduct great science and the profit margins will take care of themselves. Many Members commented on how impressed they were with the company and the belief that the people who worked there were more passionate about medicine than they were about profits. The fact that the majority of Roche is still controlled by the founding family enables it to focus on the science rather than Wall Street’s short-term expectations. We also met with Karl Mahler, Head of Investor Relations. He mentioned that Roche has more than 75,000 employees in 150 countries and is one of the largest employers in Basel. Then, in what many agreed was one of the highlights of the trip, we broke into small groups that met with research scientists who discussed the various projects they were working on while taking us into the actual labs where their tests are conducted. Some of the diseases included Alzheimer’s, schizophrenia and Fragile X syndrome – which is associated with autism. 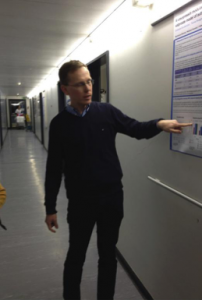 My group met with Lothar Lindemann who had created a drug for Fragile X syndrome. Fragile X expresses a protein called mGlu5. By inhibiting mGlu5, the scientists hope to prevent or reverse this condition. In mice, Roche was able to show that treatment with the mGlu5 inhibitor called RO4917523 corrects learning and memory deficits, hyperactivity to auditory stimuli and other symptoms. It is currently in Phase 2 clinical trials. The researchers did a great job of explaining the science behind their work, while keeping it at a level that we laymen could understand. Once we were done with Roche, we had a few days to really relax in Zurich and enjoy more “behind the velvet ropes” access arranged by Fritz Satran. In Vaduz, we were invited to sit in the seats belonging to Parliamentarians of Liechtenstein, and learn how their political system works. In a nutshell, the Prince has the final say on all matters, as he wields veto power. Afterwards, we were treated to champagne and a spectacular view of the Alps before lunch at the world famous Restaurant Marée at Park Hotel Sonnenhof. This was capped off by a private tasting in the wine cellar of the Prince of Liechtenstein. Moving on to Innsbruck, we toured the city, viewRoche’s Lothar Lindemann ing the famed Goldenes Dachl (golden rooftop) dating from A.D. 1500. 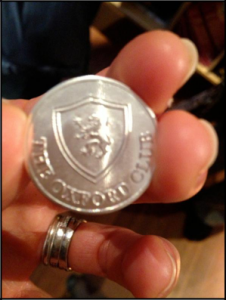 And who can forget learning about the Thaler at the Mint Museum & Hall, then climbing the four stories up to the tower with the magnificent view (and schnapps for whoever needed it) before minting our own Oxford Club coin. We enjoyed tasting the first press of wine before dinner at a traditional Viennese Heuriger in a picturesque wine village. And just outside of town, we were greeted by a bonfire, yet more glühwein and a traditional Tyrolean band (who played and got us up dancing during dinner as well) before our meal at a restaurant that has been in the same family for 15 generations. 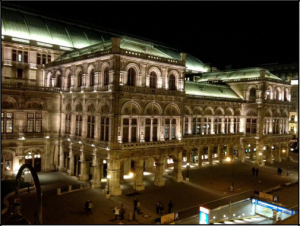 In Vienna we enjoyed true luxury at the classic Hotel Bristol, which also offered stunning views of the Vienna Opera House. Despite several days of overindulging on amazing food and wine, we were ready to get down to business again on Friday. Ronald Stoeferle of Incrementum AG got things started on our second day of seminars in Vienna. He presented a multitude of charts and facts to support his enthusiasm for gold. Ronald can be reached at rps@incrementum.li. The always entertaining Robert Vrijhof, the President of Weber Hartmann Vrijhof & Partners gave a very informative discussion on some of the myths, advantages and disadvantages of having an investment account in Europe. To reach Robert, please e-mail him at info@whvp.ch. Rich Checkan of Asset Strategies International made a convincing presentation on why every investor should have part of his or her portfolio in gold coins and bullion. We were also fortunate to have Rich along with us for the entire trip. You can contact Rich at info@assetstrategies.com. Geoff Anandappa with Stanley Gibbons Ltd. led a fascinating talk about investing in rare stamps as a way of diversifying a portfolio. For example, Queen Elizabeth has a substantial rare stamp collection that is strictly for investment purposes (as opposed to being a stamp collector for the love of stamps). His firm can put together a portfolio of rare stamps for nearly all levels of investors. To reach Geoff please e-mail him at ganandappa@stanleygibbons.com. The seminar concluded with a presentation by Mario Heider of Valartis Bank. He discussed what investors need to know about private banking in Europe. To reach Mario please e-mail him at mheider@ valartis.at. On our last day in Vienna, we visited the Kunsthistorisches, Vienna’s museum of fine arts. In the evening, our Farewell Gala was held at the 19th-century Palais Todesco. We had an elegant dinner of Austrian specialties accompanied by a selection of local delicacies. Before the evening and the trip came to a close, we were treated to some delicious chocolate by an Oxford Club Member who is Canada’s premier chocolatier. It was a fascinating excursion filled with new friends, unbelievably good food and wine, beautiful scenery, lots of laughs, gorgeous hotels and plenty of new financial opportunities to research and explore when we got home. I can’t wait for the next one; I hope you will join us again.